Fluffy Balls - fascinating game, based on famous table game "Corners". Excellent training for attention and strategic thinking. Multiplayer mode will bring more fun to any party! 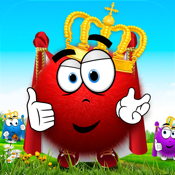 - Brilliant game design liked by adults and kids. - Free. Without annoying advertising.